Maximize the value of every dollar in your home improvement budget by including our vinyl flooring in your design plan. Whether you are redecorating an existing house or completing your new dream home, a vinyl floor is a great choice for a variety of reasons. This type of flooring is capable of withstanding the foot traffic you expect from your active family. Our vinyl floors are also easy to clean and maintain as well. When you first visit our showroom, you can sit down with one of our design specialists for a consultation. Tell us all about what you want out of your new home flooring and our representative will identify the color and texture that works best for you. The choices available to you may become overwhelming, especially if you are working with a limited budget. If you need flooring that is easy to install and maintain, our selection of vinyl sheet flooring is the answer. 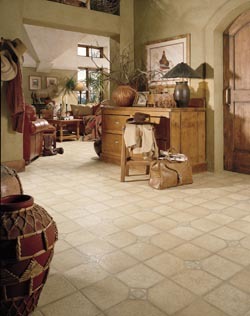 Make an investment in our luxury vinyl tile, and get a stunning look for any room. When you consider the latest advancements in manufacturing and imaging, our selection of LVT gives you an authentic look without the additional expense. As a flooring store, we separate ourselves from the competition by providing you with the best pricing and personalized service. We help you to get the most out of your flooring investment by offering professional luxury vinyl tile installation as well. When you hire a team with the right tools and years of experience, the results speak for themselves. Our combination of local ownership and national buying power makes this store the logical choice for anyone in the market for a new vinyl floor. If your existing floors have faded and warped beyond the point of repair, the value and appeal of your home may begin to suffer. Should you decide to put your home on the market, you may find it difficult to find a buyer. Whether you are interested in moving, or revitalizing the space you currently inhabit, our vinyl flooring provides you with an affordable alternative. Simplify your home life and start enjoying more time with your family when you make an investment in new vinyl sheet flooring. This product gives you an unbroken pattern without any seams or edges. These small spaces and cracks give dust and dirt a welcome place to hide. Our vinyl sheet flooring is easy to install and it cleans up with ease. If you are ready to get creative with your flooring purchase, our luxury vinyl tile is the right way to go. LVT has the durability and appeal needed to make a difference in your particular living space. This variety of vinyl can be cut into a broad array of creative patterns and shapes. The additional give makes standing for hours on end a bit more bearable, and the color is sure to last for years to come. Getting the right look and the right fit for your vinyl flooring investment is simple when you turn to our team of installation professionals. Protect the investment you have made in new home flooring by choosing our team for luxury vinyl tile installation. We take the time to measure your home accurately, and we ask you the important questions about the way you live your life. This information helps us to create a look that you can be proud of. When you consider the time and money you will save over the long run, our installation process makes a great deal of sense. Contact us today to schedule a free room measure for your new purchase of vinyl flooring. We proudly serve customers in Springdale, Fayetteville, Lowell, Cave Spring, and Siloam Springs, Arkansas, and surrounding communities.